LAS VEGAS – This is familiar territory for Zach Collins and Nigel Williams-Goss. It wasn’t that long ago the two played for powerhouse prep programs in the Las Vegas area. The pair returns home with fourth-ranked Gonzaga (29-1), which opens the WCC tournament on Saturday at the Orleans Arena against the winner of Friday’s game between No. 8 Pepperdine and No. 9 Pacific. Collins grew up in Las Vegas and he’s just a year removed from playing for Bishop Gorman. He developed into a McDonald’s All-American and helped the Gaels capture four straight Class 4A state titles. “I’m really excited, it’s my hometown and hopefully I can play well in front of family and friends,” said Collins, who earned All-WCC second-team and All-Freshman team honors earlier this week. Williams-Goss, an Oregon native, was a four-year standout at Findlay Prep in Henderson, about 20 miles from Las Vegas. Parents Valerie and Virgil moved to the area when Williams-Goss enrolled at Findlay Prep. Valerie is a therapist and Virgil sells insurance. Williams-Goss played in the 2013 McDonald’s All-American game. He spent two seasons at the University of Washington before transferring to Gonzaga. Collins and Williams-Goss are fiercely proud of their high school alma maters. 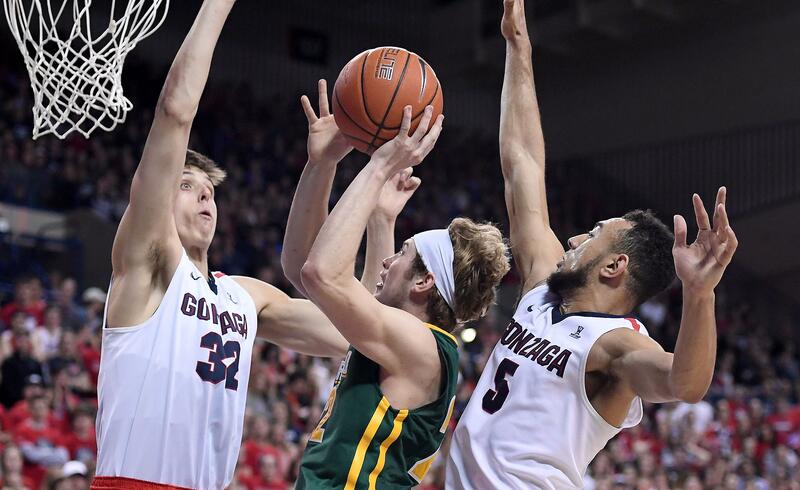 Findlay Prep and Bishop Gorman play a showcase game every season, which becomes a source of bragging rights and needling material for the two Zags. “When I was at Findlay I was 4-0 (against Bishop Gorman),” said Williams-Goss, recently named the WCC Player and Newcomer of the Year. “I can’t really call it a rivalry when I was there. But obviously, Gorman is a great program, Findlay’s a great program. Collins and Williams-Goss didn’t play against each other because of their age difference. As a freshman, Collins was called up to the varsity at the conclusion of the JV season. Williams-Goss, who lined up with future NBA players Anthony Bennett, Tristan Thompson and Nick Johnson, was 124-8 during his prep career. Findlay Prep played a national schedule and operates independent of the Nevada Interscholastic Activities Association. Bishop Gorman recently won its sixth straight state title, equaling the longest streak in state history. USC commit Chuck O’Bannon, son of former UCLA great Charles O’Bannon, scored 36 points in the title game. Charles O’Bannon and Collins’ dad, Mike, are Gaels assistants. The Gaels won state championships at the Orleans in Collins’ junior and freshman seasons. Collins’ teammates included Stephen Zimmerman, who has split time this season between NBA Orlando and its D-League team, and Chase Jeter, a sophomore at Duke. Collins gets asked all the time what it was like to grow up in Las Vegas. He’s not sure what the fuss is about.